Milwaukee is a pleasant surprise. 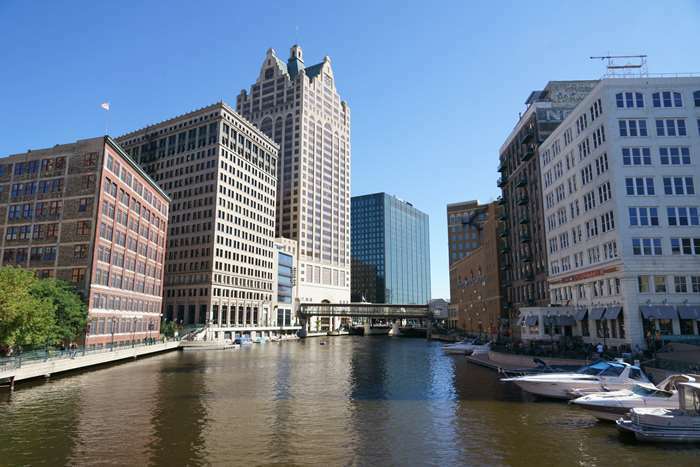 While you might expect a beer-drinking, sausage-eating working-class town stuck in the past, Milwaukee actually has a beautiful, modern downtown filled with art projects and an enjoyable riverwalk. And of course, there’s one attraction that everyone should see: the Bronze Fonz. You’ll find the Bronze Fonz along the Milwaukee River, just south of Wells Street. This is also a great place to access the riverwalk. Wells Street runs east-west, and is located a few blocks north of Interstate 794, which provides easy access to downtown Milwaukee. Since this is the 21st century, some introductions may be necessary. If the millennial in your group asks Google “Who is the Fonz”, they’ll find out he’s a TV character from Happy Days, a sitcom that aired from the mid-70’s to the mid-80’s. Happy Days was set in 1950’s Milwaukee, and its character, Arthur Fonzarelli, was the epitome of cool. 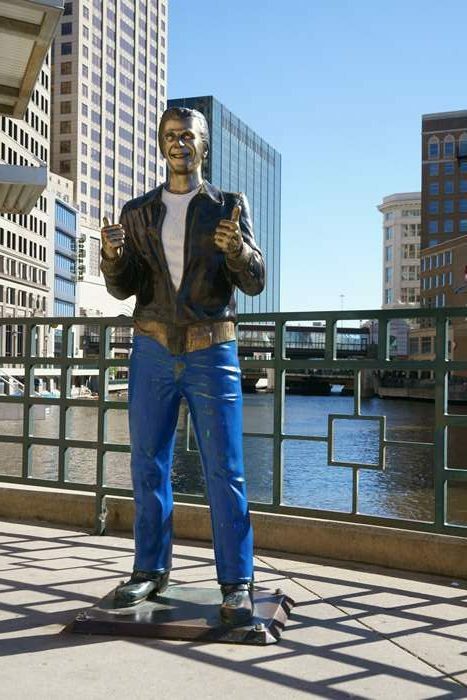 Milwaukee’s connection to the sitcom led to the creation of the Bronze Fonz statue, which has stood at the edge of the Milwaukee River since 2008 (although his blue jeans did get a more recent makeover to make them, well, bluer). Downtown Milwaukee was my first stop, on this week-long trip to find fall colors in Wisconsin and the Upper Peninsula of Michigan. I parked along Wells Street and made my way down to the Fonz in no time, and took the required thumbs-up selfies, posted to Facebook with the requisite quote, “Ayyy”. But then, I realized there was much more to see here. Milwaukee’s downtown is downright beautiful. The city’s skyscrapers form a dramatic canyon around the Milwaukee River, and it’s pretty easy to walk for a while on either side of the water. So, that’s what I did. 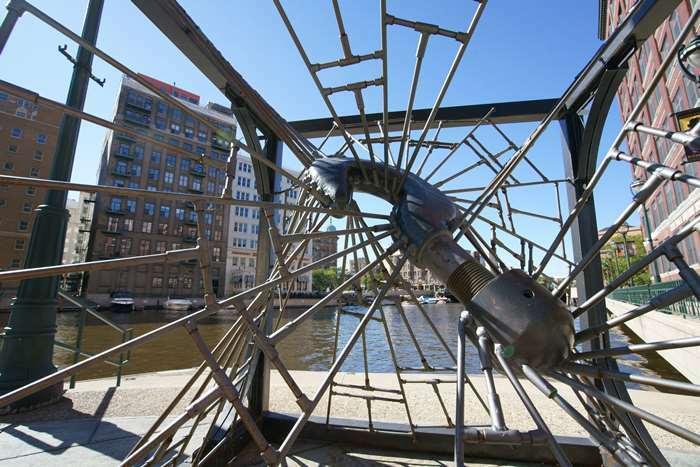 Milwaukee’s Riverwalk is dotted with interesting public art projects. I’m guessing if you dare to question the meaning of this one, it will require some out-of-the-box thinking. This is not an oversized construction zone. 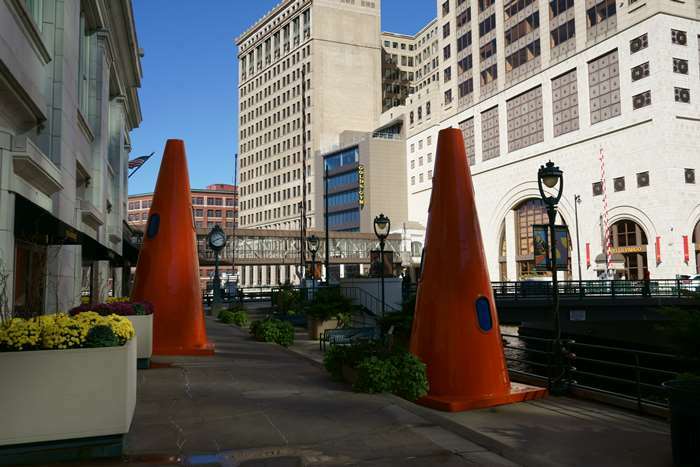 Artist Dennis Oppenheim created these larger-than-life cones, following a similar display in Seattle. 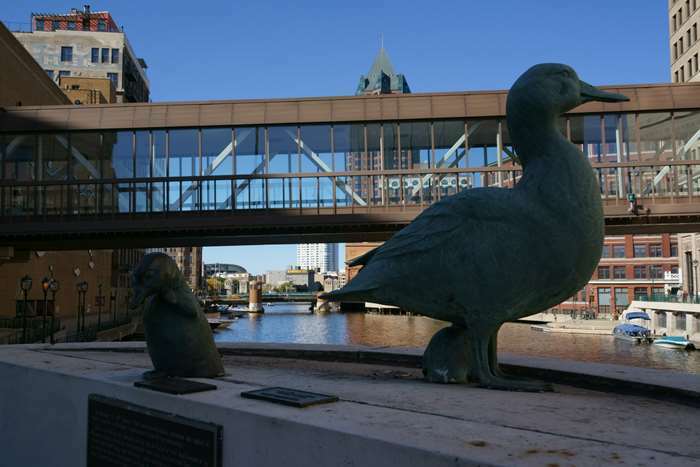 Gertie the Duck is also immortalized along the riverwalk. Gertie became the most famous duck of the 1940’s, as newspapers followed her efforts to hatch a family for weeks on end. Gertie’s statue was installed here in 1997. Milwaukee’s architecture came as a surprise to me, as well. These are some beautiful big buildings lining the river. 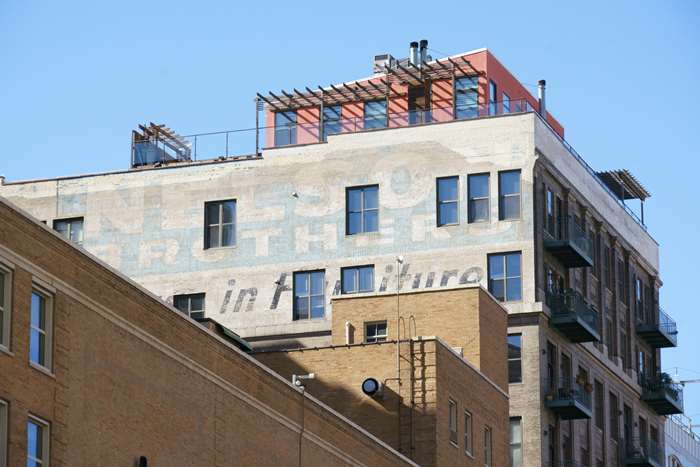 Look closely, and you might see a hint of some ghost signs. 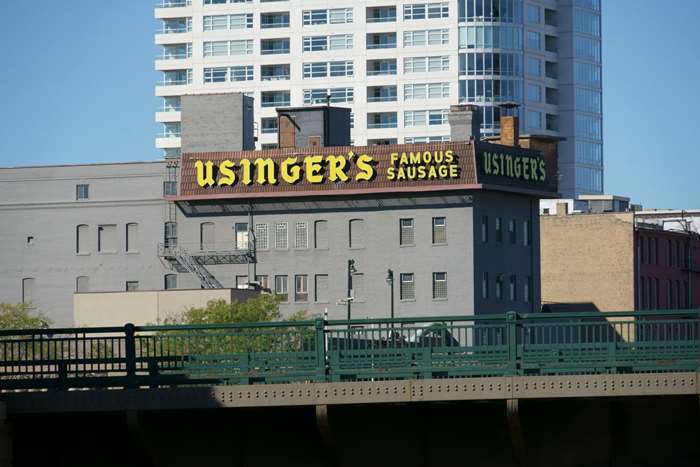 As I made my way back to my car along Wells Street, I noticed the Usinger’s Famous Sausage building a few blocks away. Now that’s the kind of thing I was expecting from Milwaukee. 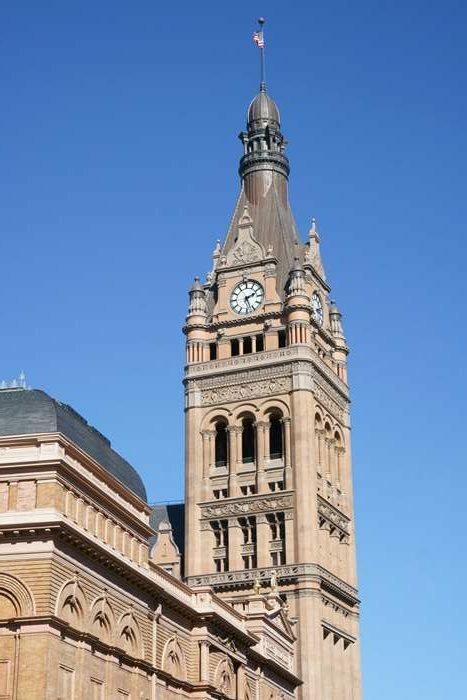 …you may recall seeing City Hall’s clock tower in the show’s opening credits. 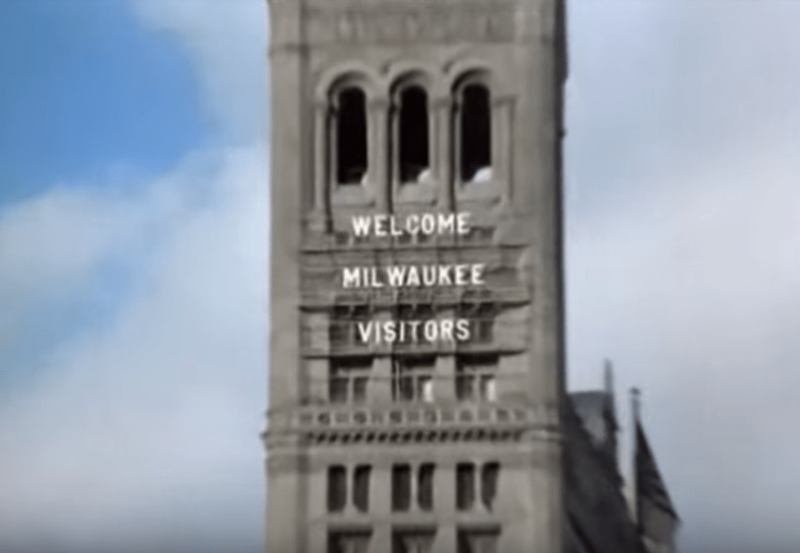 Back then, signage on three sides proclaimed “Welcome Milwaukee Visitors” and other messages. The letters were a fixture on the city skyline from 1906 until 1988 when they were removed due to maintenance costs. Those letters are now at the Milwaukee County Historical Society, where some are occasionally used in displays. After my brief introduction to Milwaukee, it was time to hit the road. I had some ground to cover over the next two days, to make my way up to the U.P. of Michigan. But, there were some interesting towns to visit along the way. Milwaukee was a pleasant surprise. I’d highly recommend taking a moment to explore the downtown riverwalk, and of course, visit the Bronze Fonz!